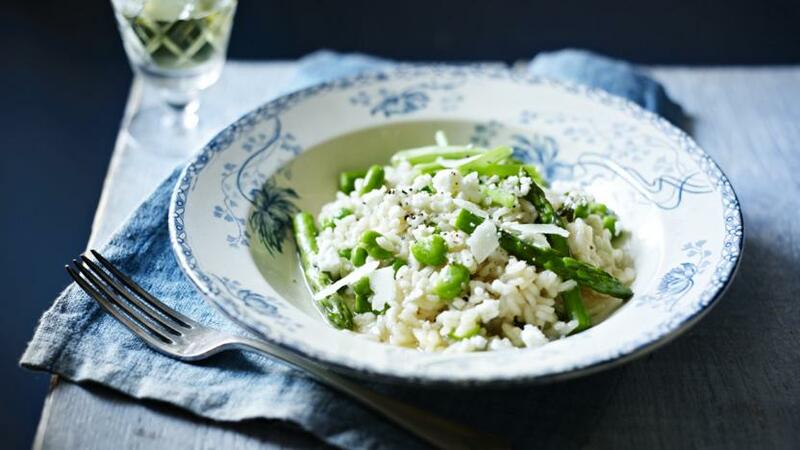 A simple vegetarian risotto by the Hairy Bikers that uses wonderfully fresh British vegetables and herbs. Fill a saucepan with water and bring to the boil. Add the broad beans and return to the boil. Cook for one minute then drain in a colander under running water until cold. Remove the beans from their skins and set aside. Mix the mint with two tablespoons of the olive oil and set aside. Melt 25g/1oz of the butter with the remaining oil in a large non-stick saucepan and fry the onion and garlic for five minutes until softened, but not coloured. Stir in the thyme, lemon zest, bay leaf and risotto rice and cook for a few seconds more until the rice is glistening. Pour the wine in to the pan and boil over a medium heat until the liquid has reduced by half. Slowly start adding the stock, a ladleful at a time, stirring well between each addition. Simmer for 2-3 minutes or until the liquid has almost all been absorbed before adding more. Cook for 15 minutes or until the rice is tender. Meanwhile, fill a medium saucepan with water and bring to the boil. Cook the runner beans for three minutes, or until tender. Drain in a colander then return to the pan and toss with a small knob of the remaining butter and plenty of ground black pepper. Remove the thyme and lemon zest from the rice and discard. Stir in the broad beans, peas and asparagus with the remaining stock and cook for three minutes until tender, stirring regularly. Remove from the heat and stir in the feta. Season with salt and freshly ground black pepper. Cover with a lid and set aside. Add the remaining butter to the risotto and stir. Spoon into four deep plates and tap gently on the work surface to spread the risotto slightly. Spoon over the minted olive oil. Top with the runner beans and shavings of fresh parmesan and serve immediately.